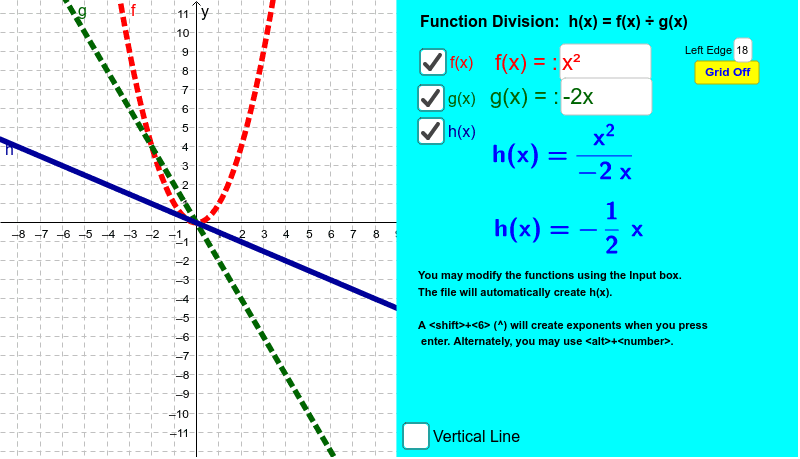 This applet will illustrate the division of two functions, f(x) anf g(x). You can display two functions by using the show check box for each equation. The default equations are f(x) = x2 and g(x) = -2x, you can enter equations of your choice by entering the function of x of your choice. f(x) will graph in red, and g(x) will graph in green. The division will displayed as h(x) and will display in blue. By clicking on the appropriate check box, you will be able to display each graph separately or together. Prior to displaying the solution function h(x), use the point tool to locate points on the grid for h(x), i.e., read the y-values of f(x) and g(x), perform the arithmetic operation chosen, and plot the y-value of h(x). Select at least 5 points to illustrate the trace of h(x). If using SMART or Promethian board have students find and plot the points. Hide f(x) and g(x) to allow users to determine a pattern before displaying f(x).